“The ball was round, the equpiment was homemade, and the rules were uncertain, but that game the boys were playing on the lawn at Mercer University in 1892 was football...” Thus begins this colorful history of football at Mercer University, 1892 to 1942. Mercer had only 179 registered students in 1892 when the first Mercer eleven met the first Georgia eleven on the gridiron in Athens in January 1892, the first college football game in the state of Georgia, and one of the first in the Southeast. College football in 1892 was a far cry from the organized splendor it is today. Uniforms were makeshift, with little or no padding. Players begin growing their “helmets” or “head pads” in early summer, and rumor has it that those long, bushy manes prompted Mercer’s nickname—the Bears. It was a rough-and-tumble, disorganized free-for-all on the 110x53 yard field. Touchdowns counted four points; extra points, two; field goals, five; and safeties, two. But all those interesting facts—and many more—are included in this exciting chronicle. For fifty years Mercer played against the the great (Alabama, Army, Georgia, Florida, and others) and the nearly great (Savannah Library Association, Locust Grove Institute, North Georgia Aggies). Alas, college football eventually became a big (and expensive) business, and with the US facing world war, the last Mercer team was fielded in 1941. But, beginning in Fall 2013, the Mercer Bears will once again take the field following a seventy-year hiatus. This time, however, the helmets are much improved. 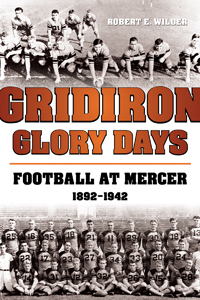 A departure from the usual fare published by Mercer University Press, this unique volume will be of special interest to all Mercer alumni, as well as to sports fans who are interested in the history and development of that most popular American “glory game”—college football.